I grew up in a family with two working parents. Saturday was always shopping day, and our weeknight dinners were fast. Even with our busy schedules, weeknight cooking shouldn't be a chore, which is why my working-week mantra is work smarter, not harder. I hope these scrumptious and speedy recipes will give you more time to savour sharing the food you prepare; after all, the joy in cooking is sharing meals with your friends and family. Cacio e pepe, meaning "cheese and pepper" in Italian, is usually associated with the famous Roman pasta dish. Here, I use this simple combination to make pumpkin shine. 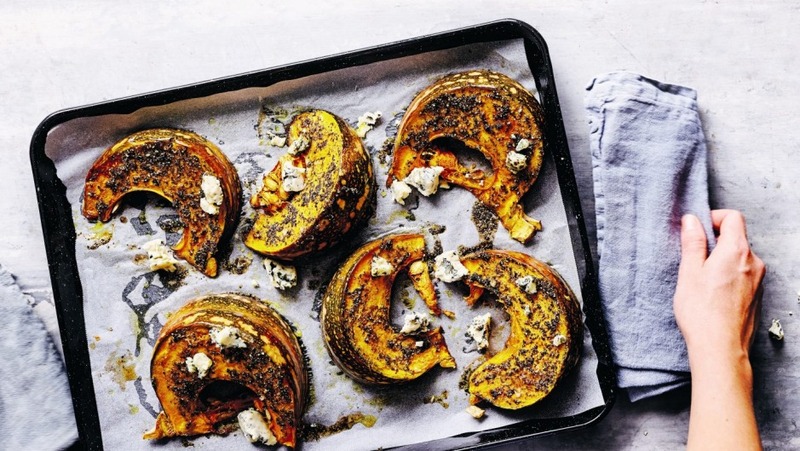 I originally prepared this recipe using parmesan on my show Everyday Gourmet, but I think the sweetness of the pumpkin and the heat from the pepper are even better paired with blue cheese. Serve with roast chicken or lamb chops, or toss with crisp lettuce leaves for a warm salad. 1. Preheat the oven to 180C (160C fan-forced). Line a baking tray with baking paper. 2. Crush the peppercorns using a mortar and pestle, drizzle in the oil and mix to form a paste. Season with salt, then drizzle over the pumpkin and rub in. Place the pumpkin on the prepared tray and bake for 30-35 minutes until just tender. 3. Crumble the blue cheese over the top and serve. The cheese is interchangeable; this recipe also works really well with pecorino, parmesan or feta. Cottage pie is usually made with beef or lamb, but I sometimes like to change up the meat component – in this instance, the filling is a quick chicken stew. The stew itself is worth making because that traditional pairing of cream and mushrooms is always so satisfying. 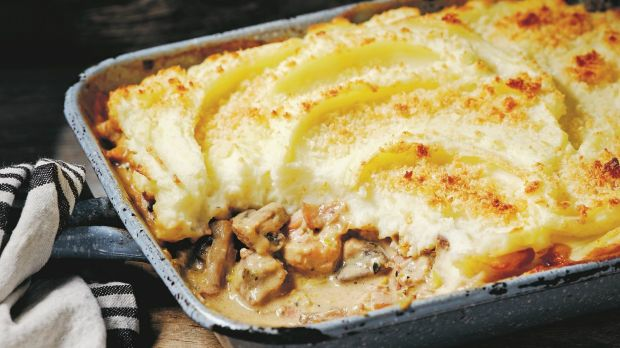 Crowned with lashings of creamy mashed potato ... well, what more can I say? A lot of people are going to love you for making this for them! 1. To make the mash, place the potato in a saucepan, cover with cold water and add a pinch of salt. Bring to the boil and cook for 20 minutes, until the potato is soft. Drain in a colander and allow the steam to dissipate. Return the potato to the pan and mash, then add the butter. Keep mashing until the butter has melted into the potato, then pour in the hot milk. Whip the milk through with a wooden spoon until a smooth, thick mash forms. Check the seasoning and add a pinch of pepper. Cover with the lid and reserve for later. 2. Heat one tablespoon of oil in a large saute pan over high heat. Add the chicken, season with salt and pepper and cook for four to five minutes until lightly coloured. Remove from the pan to a plate and set aside. Reduce the heat to medium. Add the remaining oil, the leek and speck or bacon to the pan and saute for three to four minutes. Stir in the mushrooms and thyme and cook for a further three to four minutes until softened. 3. Preheat the oven to 200C (180C fan-forced). 4. Return the chicken and any juices on the plate to the pan. Stir well and deglaze the pan with the wine. Bring to the boil, then mix in the mustard and add the cayenne pepper and stock. 5. Reduce the heat to low and simmer for 10 minutes until reduced by one-third. Mix through the creme fraiche or sour cream and cook for 3-4 minutes until thick enough to coat the back of a spoon. 6. Pour the chicken stew into a two-litre baking dish and spread out evenly. Dollop the mash over the top and, using the back of a spoon or a fork, spread to cover (make a swirly pattern if you like). Sprinkle over the cheese and breadcrumbs and drizzle with a little extra olive oil. Place the dish on a baking tray and transfer to the oven. Bake for 25–30 minutes until golden on top. Note: I like to use chardonnay or sauvignon blanc in this recipe, but any white wine is fine. This stir-fry brings together two ingredients I love so much: fresh rice noodles and peppery steak. It's a spin on the Vietnamese dish shaking beef (bo luc lac), but instead of serving the meat by itself, I take things up a notch and toss it with silky noodles. The beautiful thing about a stir-fry is that you can add lots of different vegetables. I've kept mine very basic, so you can be the master chef and add your own twist. 1. Combine the oyster sauce, sugar and sesame oil in a large glass or ceramic bowl. Add the steak and toss to coat, then marinate for five to 10 minutes at room temperature. 2. Heat half the oil in a wok or large frying pan over high heat, add the steak, in batches, and cook for 20-30 seconds to seal and scorch slightly. Transfer to a plate and set aside. 3. 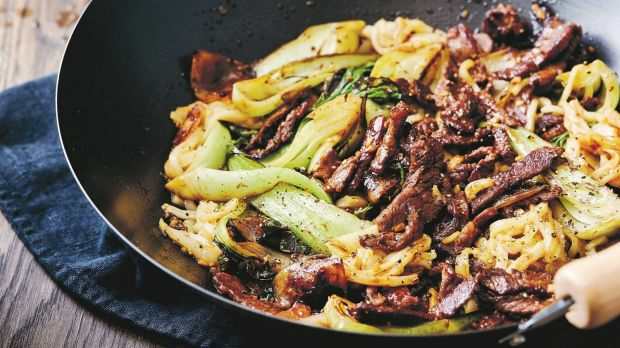 Heat the remaining oil in the wok or pan, add the onion, ginger and bok choy and stir-fry for one minute until the onion is lightly caramelised. Now add the pepper and toss a few times before returning the meat, and any juices on the plate, to the pan. 4. Add the noodles, soy sauce and lemon juice and toss to warm the noodles and coat the meat in the sauce. Serve immediately. 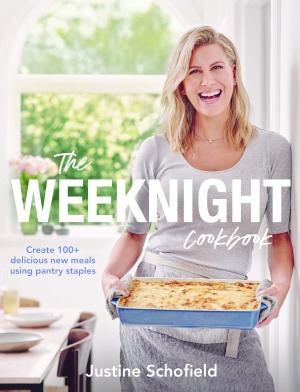 Recipes from The Weeknight Cookbook by Justine Schofield, published by Plum, RRP $34.99, photography by Jeremy Simons.